As culverts and pipes are worn away with time and use, their structural integrity begins to crack, corrode, and fail. Water entering the pipe, rather than flowing from inlet to outlet, begins leaking into damaged areas, which over time weakens the integrity of the area holding the pipe in place and causes the pipe to become out-of-round. Since most culverts run under a roadway, the damage to the integrity of that road can cause major transportation issues or other catastrophic events. Digging up the pipe or culvert is not always an option, because of transportation logistics or financial limitations. We provide a cost-effective alternative, ovalized culvert liners. 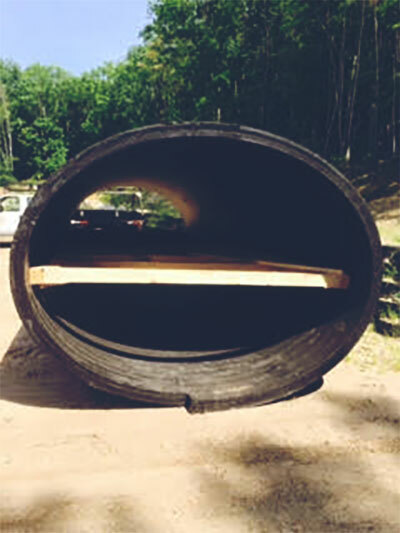 We have the only machine in New England that can ovalize pipes to fit into an out-of-round culvert, and we have installed these ovalized culvert liners in pipes throughout the Northeast. Contact us today for a free ovalized pipe liner evaluation and estimate. If you are interested in our pipe ovalization services, please contact us today. In addition to our culvert services, we also offer snow removal for clients around our Auburn office. We can sand and salt, or we can schedule a continual plowing service for throughout the length of a storm. Contact us today to begin snow removal services. Sometimes culverts need to be excavated. Sometimes they need to be moved. We maintain a fleet of equipment capable of ensuring no job is left undug. If you need our excavation services, either for sitework or culvert removal, we’re here to lend a hand.